An upgrade, or a Power Item in the original Metroid, is any advancement in technology or ability of Samus. Upgrades are present in every Metroid game thus far. They are necessary to complete every game (with minor exceptions). Although most upgrades are weapons, such as the Ice Beam, there are several other upgrades that enhance Samus's abilities. Most upgrades notably build on the Chozo-built Power Suit, since the Power Suit's versatility allows for easy upgrades. Upgrades allow Samus to progress, increase offensive or defensive capabilities, or both. Featured in every single Metroid game to date. It is Samus's standard suit and an advanced piece of Chozo technology, allowing it to be augmented and function much more effectively than its basic form. It offers protection from the infinite vacuum of space and can protect Samus from falls of any height. It has basic armor covering all of Samus' vital areas and offers some protection against enemy damage. Also featured in every Metroid game, the Varia is the gold standard for armor in the Metroid universe. This suit provides additional protection that the Power Suit does not, including heat resistance. In some games, it reduces damage taken from enemies and hazards by a certain percentage. Notable features include large shoulder spheres, more pronounced knee spikes, and an armored chest plate, all of which make this suit easily recognizable among Metroid zealots. Featured in Metroid: Zero Mission, Metroid Prime, Super Metroid, Metroid Fusion, and Metroid: Other M, the Gravity Suit adds added protection that varies by game and negates the effects of hindered movement in liquid environments. It also clears the fog on the Combat Visor that's present in Prime, and it protects Samus while on the outskirts of the Frigate Orpheon above Tallon IV. In Zero Mission and Super Metroid, the Gravity Suit also protects Samus against damage caused by lava or magma present in Norfair, reducing damage taken by 50% and 25%, respectively. In Other M, it's referred to as the Gravity Feature and eliminates the effect of gravitational fields caused by Nightmare and present in Sector 2 as well as reducing damage taken by a whopping 75%. It also resists the vacuum of space, to which Samus is exposed during her encounter with Phantoon. The suit is visually identical to the Varia Suit, though it is colored either purple or blue. In Other M, however, it appears as a purplish aura around Samus, only present when exposed to the aforementioned hazards. This suit is an three-in-one upgrade appearing in Zero Mission after Samus completes the Ruins Test in Chozodia. After losing her Power Suit and its abilities, Samus regains them with the addition of previously unusable Chozo upgrades: the Plasma Beam, Gravity Suit, and Space Jump. Samus's Legendary Power Suit requires immense concentration to use. Exclusive to Metroid Prime, the Phazon Suit is the only suit acquired in the Prime subseries, without the PED Suit, that isn't in item form. Samus gains this upgrade after the Omega Pirate collapses on her following its defeat in the Phazon Mines, infusing her Gravity Suit with the "unique Phazon" present in the Omega Pirate. The suit is physically the same as the Varia and Gravity suits but features a jet-black and red color scheme. In the Upgrades section of the Prime pause menu, it also shows Samus having a light-bending field around her. Along with 50% damage reduction, the suit protects Samus against damage caused by Phazon and allows her to fire the Phazon Beam in the battle against Metroid Prime. Present in Metroid Prime 2: Echoes, the Dark Suit is a suit of armor previously worn by A-Kul, the "Champion of Aether, during the Luminoth's war with the Ing. It reduces the caustic effects of Dark Aether's atmospheric damage by 80%. It doesn't resist the effects of dark energy-based weaponry used against Samus, however. After A-Kul's death at the hands of the Ing in the Sky Temple Gateway, the Ing steal her armor and place it in the protection of Amorbis, guardian of the Dark Agon Temple. After being defeated by Samus, Amorbis relinquishes the suit. Physically, the suit looks much more mechanical than the Varia Suit. The suit has what appear to be circuit board-like lines throughout. It also has a space for the Gravity Boost and Grapple Beam, both of which are acquired later on in the game. It is Samus' primary suit throughout the entire game, as she uses it against all future boss battles, save for the Emperor Ing and the final battle with Dark Samus in the Sky Temple Gateway. Counterpart to the Dark Suit, this suit is acquired after Samus restores the Light of Aether to the Agon, Torvus, and Sanctuary Temples in Aether's light dimension. The Light Suit is the perfect marriage of the Chozo's and Luminoth's advanced technologies. Is is a much more streamlined suit, with more speherical shoulder spheres and humongous semi-circular knee spikes, and the suit itself sports an almost entirely white color scheme. It has tiny holes all over it that allow for light to be emitted from it. The suit also can utilize the Light-Based Teleportation System that allows Samus to travel instantly between the Great Temple and the three subtemples on Aether. There are teleportation systems in variety of places on Aether and Dark Aether. The Light Suit fully resists the corrosive atmosphere of Dark Aether by 100%, but dark energy based attacks can still hurt her. It also fully resists the effects of the Ingstorm. The Fusion Suit, available only in Metroid Fusion, is a result of the removal of parts of Samus' Power Suit that are infected with the X-Parasite and Vaccine "Metroid". It is the primary suit used in Fusion and has all original functionality of the Power Suit. Because it is less bulky due to the removal of infected parts, Samus can climb onto ledges without the Power Grip. Due to Metroid DNA being in the suit, it inherits the Metroid's natural weakness to cold, which doesn't allow the suit to use the Ice Beam. Also, the Charge Beam also fires differently. The PED Suit was given to Samus in Metroid Prime 3: Corruption by the doctors and scientists on Norion after the Space Pirates, led by Dark Samus, attacked the Galactic Federation base stationed there. After Samus, Rundas, Ghor, and Gandrayda were knocked out by Dark Samus and corrupted, Samus awakes one month later in a Galactic Federation infirmary; she is outfitted with the suit by the Galactic Federation scientists while they are repairing her damaged Varia Suit. The PED Suit takes advantage of the Hunters' ability to self-generate Phazon and gives them immense offensive capabilities. The Suit injects one of Samus' Energy Tanks and activates Hypermode. After 15 seconds of being in Hypermode, Samus will going into corrupted mode, in which Hypermode cannot be cancelled, and she must exhaust all the Phazon of the current energy tank to avoid total corruption, although it does have a safety feature that disables the mode after 25 seconds to help alleviate the risk of total corruption. When Samus walks in a pool of Phazon, it replenishes her energy. The PED Suit appears like the Varia Suit, but with many pieces missing and replaced with Galactic Federation technology. The Arm Cannon also gains the ability to fire the Hyper Beam whilst in Hypermode. The Hazard Shield is a piece of Space Pirate technology that protects the wearer from the environmental hazards. Samus gains this unit later on in the game and can be used to walk through the Acid Rain on the Pirate Homeworld, as well as the Fuel Gel on Bryyo. It adds hexagonal-shaped shields on Samus' shoulders and chest. When Samus is in a hazard that shield protects her from, the Shield glows orange and shimmers. In Morph Ball mode, this is also apparent. The Zero Suit is a skin-tight singlet that Samus wear underneath her Power Suit. It is connected to her central nervous system, allowing her to activate and deactivate part, or whole, suit she has over it. The suit is affected by her mental state, when in distress, she loses her ability to control whether or not the suit is active, this apparent in her encounter with Ridley in Metroid: Other M. The Suit is blue-hued and has high heels that still allow Samus to be as nimble as in the Power Suit. Samus' standard beam, the Power Beam, has a very high rate of fire and low damage. It has inexhaustible ammunition due to the nanotechnology built into the Arm Cannon by the Chozo. Allows Samus to charge up her currently active beam to up to ten times the damage of one shot. It is accompanied by a visual cue that let's the player know it's fully charged. It can be used with all beams, minus the Phazon Beam, including the Paralyzer. In the Primes, a sustained fully charged shot can act like a tractor beam, attracting pickups into Samus. The Wave Beam travels through walls, transparent, and translucent objects. It is much more powerful than the Power Beam and, in Metroid Prime, it shoots electrical energy and can be used to open Purple Doors on Tallon IV, as well as energize Power Conduits, homes in on enemies, overloads electrical enemies, and defeats Wave Troopers. In Metroid Fusion, it allows the Arm Cannon to fire two separate beams to fire simultaneously. The Ice Beam is a very integral weapon in the entire Metroid series. It makes killing Metroids possible by freezing them and shooting a couple Missile. It fires a blast of ice and can freeze most enemies when charged or will slow them down. The Plasma Beam fires very powerful waves of energy that can travel through anything, walls, glass, and even enemies, allowing to hit multiple targets. It is Samus' most powerful conventional weapon in every appearance. In the Prime series, it fires molten energy that can set most enemies on fire, and even disintegrate some enemies. In Corruption, it can also be used more intricately to weld broken circuits to restore power to devices. Not necessarily an offensive weapon, although it can be used as such in Super Metroid, the Grapple Beam fires a rope-like beam of energy that Samus can use to swing and propel herself to ledges too far or high to jump. Only certain points are viable attachment points for the Grapple Beam. In Prime, Samus lost the beam in an explosion on Frigate Orpheon that caused many of her suit's functions to malfunction. She again lost the Grapple Beam in Echoes when it was stolen by the Ing when Samus followed Dark Samus through a Portal into Dark Aether and given to a Dark Grenchler that resides in the Crypt. Upon defeat, it drops the Grapple Beam and can be retaken into Samus' arsenal. Only in Metroid: Other M, it makes charged Arm Cannon shots diffuse upon hitting a target to hit multiple enemies. It is compatible with all other beams Samus acquires in the game. The Long Beam makes Samus' beam shots stretch all the way across the screen in the 2D games. It doesn't add any power or any other effect, it just extends the distance the shots go. Only appearing in Metroid Fusion, the Wide Beam adds no power to each individual shot, but it does fire multiple shots that make it easier to hit enemies. There is no other useful make of this beam. This beam also widens Samus' beam shots and doesn't add any firepower. Although, in Other M, the Diffusion Beam functions similarly to the Spazer Beam. The Dark Beam is one of many items originally wielded by A-Kul during the Luminoth-Ing War. After failing to become useful to the Luminoth, they abandoned the Dark Beam expansion to focus on other ventures. It fires a rather large, spiral-shaped ball of dark energy. It is very useful against light enemies. The charged version is called the Entangler and can freeze enemies solid, similar to the Ice Beam. It can also nullify Light Beacons and Light Crystals. It can also activate Portals to Dark Aether, activate Lift Crystals, and overload light-based shield such as those on the Ingsmashers. The Light Beam was also wielded by A-Kul and was proven to be very effective against the Ing. Samus find this in the hands of Ing. It fires a stream of white-hot light energy and can set enemies on fire. The charged version is the Lightblast and fires like a shotgun, as one big blast. However, if locked on, all the shots will home in on the enemy. It can energize Lift Crystals, Light Beacons, and Light Crystals temporarly. It can also overload dark-based shields on enemies and activate Portals to Aether. The most powerful weapon wielded by A-Kul, it fires light and dark energy at the same time. It has a rate of fire comparable to the Power Beam and can home into enemies without even locking on them. Quadraxis guards this item, as it is incredibly prized by the Ing, and it uses it against Samus in their battle in the Hive Temple. It can supercharge Crystals and Beacons that allure Ing to come into it's destructive field and kill them instnatly. The charged shot is the Disruptor. When paired with the Echo Visor, it can also override Echo Key Beam Systems. It can also energize Light and Dark Portals. Lastly, it can also overload shiels of light or dark polarity. Space Pirate technology, the Nova Beam fires high-frequency shots that can pierce Blue Phazite Armor as well as Metroid membranes and strike their nuclei, resulting in instant death. It's slightly more powerful than the Plasma Beam. The Phazon Beam is a beam in Metroid Prime that allows Samus to draw on the power of Phazon and fire it. Although she obtains the Phazon Beam after fighting Omega Pirate, she doesn't use it until the final boss fight when standing in a pool of liquid Phazon. The Arm Cannon becomes covered in Phazon veins and shoots out what appears to be eletrical rays of energy to damage enemies. The Phazon Beam, when activated, is called the Hyper Beam. It is vastly more powerful than any other weapon Samus possesses and can kill any enemy much faster and more efficiently. In Super Metroid, when the Baby dies above Samus, it collapses on her and gives her the Hyper Beam that allows Samus to kill Mother Brain. It fires a rainbow-hued stream of energy that is immensely powerful. It is the only weapon capable of killing Mother Brain. Samus's Phazon Beam, when used to its full capacity against Metroid Prime, is called the Hyper Beam. In Metroid Prime 3: Corruption, when Samus enter Hyper Mode, she fires a very powerful beam that can kill any enemy faster and overload enemies with Phazon energy to damage them. It also can be charged in Corruption to fires and continuous stream of Phazon bullets for a few seconds until the charge wears off. The weapon of choice by Weavel, it fires green shots of energy that arc downward and causes a small explosion upon impact. It's fueled by the Universal Ammo. The weapon of choice by Trace, it is a sniper rifle the fires a highly accurate shot from a long distance. It is the only Affinity Weapon that cannot be charged. The firing rate is slow, but the damage is incredibly high. It's fueled by the Universal Ammo. The weapon of choice by Noxus, it fires purple shots of sub-zero plasma that freeze anything in its path. It's fueled by the Universal Ammo. The weapon of choice by Spire, it fires a grenade of magma that can bounce off walls and floors and explodes a few seconds later with explosive force. It's fueled by the Universal Ammo. The weapon of choice by Sylux, it fires blue shots of energy effective at close range. If locked on for a few seconds before firing, the damage increases. Only Sylux can use it to its full potential, using it to restore his own health. It's fueled by the Universal Ammo. The weapon of choice by Kanden, it fires yellow spheres of energy straight ahead. It's slow, but deal more damage when compared to similar weapons. It's fueled by the Universal Ammo. An extremely powerful weapon Samus used against Gorea in Metroid Prime Hunters. It is located in the Oubliette. It was apparently developed by the Alimbics before they were wiped out by Gorea before Samus' arrived. Samus' pistol she uses for offense when in the Zero suit. It doesn't have an real power. Even when fully charged, the shot only stuns enemies, allowing Samus to escape and/or hide. 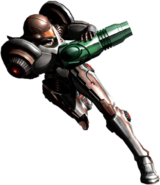 Samus' basic ballistic attack, the Missile has been in every Metroid game to date and are one of her most used items in the series. It can destroy objects made of Brinstone or Radion. Missiles have a limited homing capability and can't make sharp turns. It is also the precursor to the Seeker Missiles and all the Charge Combos. Samus can carry many missiles and in Other M', she can restore them using the Concentration technique. A piece of Luminoth technology that wwas originally used by A-Kul and her vast array of advanced weaponry. It fires up to 5 regular missiles simultaneously at one to five targets. It can get be used in conjunction with the Dark Visor to deactivate inter-dimensional locks. The Seeker Missiles are a natural technique of the Rhedogian, which suggests the Luminoth may have encountered one and set out to copy its ability to destroy the Ing. It is especially helpful in the Chykka fight for destroying its wings and Helios in his disc form. The Ice Missile is a regular missile that has ice capabilities and replaces the Ice Beam in Metroid Fusion. It can freeze Fuel Gel solid and safe to walk on and can freeze enemies solid. A Friend Voucher can be obtained by freezing a Reptilicus and shattering it with its own boomerang. The Diffusion Missile only appeared in Metroid Fusion and adds a spreading effect to the Ice Missile and freezes more enemies and cause more damage. The Ship Missile is only in Corruption. It is the only weapon capable of destroying objects made of Maldium or Jovian Steel. It is used extensively and a fired in a carpet bombing fashion. The Hyper Missile is the Hypermode version of the Missile. Like all Hyper Mode techniques, it can only be used when in Hyper Mode and is extremely powerful. It replaces the Super Missile in Corruption. It is a regular missile that is packed with Phazon, it fires in a straight line with no homing capability at all, so it requires very steady aim, but causes massive damage to an impressive range from the point of impact. It is as powerful as 10 standard missiles and is extremely effect when fighting Omega Ridley, Dark Samus (if timed properly), and Aurora Unit 313. 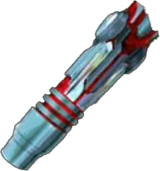 The Super Missile has appeared in most all Metroid games, it is an upgraded version of the Missile and is much more powerful. First appearing in Super Metroid, it is as powerful as five regular missiles and can dislodge small enemies from the ceilings and walls in Super Metroid. In Metroid Prime, it is powerful enough to destroy objects made out of Cordite. The can also destroy Green blast doors in Metroid Prime 2: Echoes. In Zero Mission, they returned to the way they operated in Super Metroid an they are not required to complete the game if the player uses Secret Passages. In Metroid Prime 3: Corruption, the Super Missile is replaced by the Hyper Missile. The Wavebuster is the charge combo for the Wave Beam. Appearing only in Metroid Prime. It fires a constant stream of electrical energy that automatically locks onto enemies without the effort of the user. It costs 5 missiles per second after firing to damage enemies constantly. It also is especially helpful to defeat Wave Troopers, Meta-Ridley, and the exoskeleton of Metroid Prime when it's in it's purple form that's weak to the Wave Beam. In the non-Trilogy NTSC version of the game, it can also paralyze enemies until they are dead, a feature removed in the Trilogy and never present in the PAL version. The Ice Spreader is the charge combo for the Ice Beam. It fires a large homing missile made of ice that, when hitting a surface, covers a very large area in a thick sheet of ice that freezes most enemies in the area. It does have limitations, though, it costs 10 missiles, despite only being as powerful as the Super Missile. Also, when fired at an aerial enemy, the ice damage is contained to that one enemy, so it can't be used to take out multiple Flying Pirates or any other airborne enemy. It is also the only conventional weapon in Samus' arsenal that can freeze Metroid Prime's exoskeleton solid when it's in its white form, subject to the Ice Beam. The Flamethrower is the charge combo of the Plasma Beam. As the name implies, it fires a continuous stream of fire that can set enemies on first and kill most small enemies in a few seconds or even instantly. It can be used to set Metroid Prime on fire during its red phase. The Dark Burst is the charge combo for the Dark Beam. It fires a small, medium-speed, projectile at enemies. Upon contact with an enemy or the ground/wall, it opens a rift into a dark dimension (not Dark Aether) and pulls enemies into the rift. It is especially useful for killing a swarm of small enemies such as Sandbats, Nightbarbs, Hydlings, and especially help during the Chykka battle when it releases its Chykling offspring to replenish Light Ammunition to use against Dark Chykka. It causes extra damage to light enemies. It can't pull in larger enemies, but does severely damage them. The Suburst is the charge combo for the Light Beam. It fires a small, very slow, rainbow-colored projectile at enemies. It carries the property of the Light Beam to incinerate enemies in it's path. Upon contact, it explodes in an extremely bright, rainbow explosion that can kill any enemy in its blast radius. It doesn't kill larger, more powerful, enemies, but it does severely damage them. The Sonic Boom is the charge combo for the Annihilator Beam. It fires a single wall of force that travels at the speed of sound, 1236 km/h or 768 MPH, and hits its target almost instantaneously. It causes massive damage and can kill most enemies in a single shot. When hit, the force explodes and causes a reality-warping appearence to the affected area and causes a loud crack of sound (similar to the sonic boom caused when a supersonic aircraft break the sound barrier). Is it extremely effective against agile foes, as its speed overtakes them and they cannot escape before it hits. The Morph Ball is Samus' alternate form, just like the other Hunters have theirs. When activated, Samus rolls into a ball approximately 1 meter in diameter. Samus become a ball of energy inside the ball with an approximate volume of ~0.52 cubic meters, somehow she can condense her entire being consciously and still maintain control. It is a key upgrade and lets Samus explore many many new areas. It can upgraded itself in many different ways. This is Samus' primary attack method while in Morph Ball form. It can destroy objects made of glass, Talloric Alloy, and sandstone. It is relatively weak and doesn't do much damage, but is critical for defeating some bosses, such as Flaahgra, the Power Bomb Guardian, Quadraxis, and Amorbis, doing massive damage to all of them. It can also propel the Morph Ball up if laid directly on top of Samus and she doesn't move. This is Samus' most powerful item in her conventional weapon arsenal. When unleashed, it creates a massive thermonuclear explosion that can destroy any living thing within its radius, even going offscreen. It can destroy most enemies in one hit, including certain bosses. It can incinerate organic matter, meaning it can instantly kill Metroids and Space Pirates instantly. It can also instantly kill the Rhedogian in Other M, despite it's intense durability. It is also the only weapon powerful enough to destroy objects made of Bendezium and Denzium and Gerons. Lastly, it is the only weapon powerful enough to cause a Desbrachian to awaken on the Bottle Ship, but a second one will not kill it. While the Power Bomb's devastation is dialed down quite a bit in the Prime subseries, it is still a very potent weapon and can kill most enemies instantly, including the light and a dark Ingsmashers. The Boost Ball is a movement system designed by the Chozo for the Morph Ball. Featured only in the Prime subseries and Hunters, it is a chargeable item that propels the Morph Ball at high speeds. It can damage most enemies and is useful for damaging low targets on several bosses in the games. It can also be used on half-pipe like formations that allow Samus to reach all new areas. It is used to activate the many many Spinner Devices found all over the games and propel the Morph Ball away from Spider Ball Tracks in Echoes and Corruption. The Ballspark is unique to Metroid: Zero Mission, it combines the Speed Booster and Morph Ball. When Samus builds up her energy with the Speed Booster, she can go into the Morph Ball and propel herself in one direction, the same as the Shinespark, but in a smaller form. The Spider Ball is an upgrade to the Morph Ball that allows Samus to cling to walls climb them to reach heights that are inaccessible by any other method. First appearing in Metroid II: Return of Samus, it allowed Samus to cling to nearly any surface. In the Prime subseries, it is limited to Spider Ball Tracks. It functions the same in all games. It is key to defeating certain bosses and is one of the items stolen from Samus in the prologue to Echoes. The Spring Ball is an upgrade that lets Samus hope while in Morph Ball form. Originally from Metroid II: Return of Samus, it was also present in Corruption and the Trilogy Versions of Primes 1 and 2. In games with the High Jump Boots, it comes automatically, but it must be collected on its own merit in Metroid II and Super Metroid. The Hyper Ball is the Hyper Mode upgrade of the Morph Ball acquired from defeating Mogenar in Metroid Prime 3: Corruption. It can only be used in Hyper Mode. When activated, it releases what appears to be electricity from the Morph Ball and damages enemies. It is especially helpful to killing Metroids. It does only work at close range and uses a lot of Phazon energy as opposed to other Hypermode attacks. The Combat Visor the main visor used in all the Prime games, it shows Samus' environment in front of her, as well has a mini map, energy counter, missile counter, 3-dimensional radar to find enemies, environmental hazard warning meter, current visor selected, and current beam selected. It is Samus' most used Visor. Also in all the Primes, as well as Other M, the Scan Visor allows Samus to scan enemies and objects in her view to gain information on how to defeat enemies, hints on how to solve puzzles, and read Lore left behind by the civilization(s) that once lived on the planet she is on. The Space Pirates experimented with thermal vision technology and found it extremely useful in the energy production by Phazon. When activated, it shows the heat signatures of anything in Samus' view. Enemies can be easily tracked using it, but it cannot see into other timespaces and some enemies can avoid it. The Thermal Visor is useful in cooler environments, as enemy heat signatures are more contrasted, but can overloaded by hot climates, brightly lit areas, explosions, and extreme radiation. The X-Ray Visor emits x-rays that allow Samus to see though almost anything in her environments. It allows Samus to track nearly every creature accurately. It can be overloaded in areas of intense Phazon radiation. It also has the ability to look through Phazite armor, but not the red variety. Also, it can be used to accurately locate a Phazon Metroid's or Metroid Hatcher's nuclei which, when combined withe Nova Beam, allows for a one-hit kill, rather than a fierce battle. An alternate form the X-Ray Visor, the Scope allows Samus to see the composition of objects to see how to destroy them. It also allows Samus to see through objects that are fake. Obtained in Dark Torvus Bog, the Dark Visor was stolen by the Ing after they killed A-Kul during The Last Crusade. It lets Samus see inter-dimensional objects. Similar in function to the Thermal Visor and X-Ray Visor, it allows Samus to track enemies to a T, even when they warp to other dimensions to escape predators, when Ing are in their amorphous state. It also allows Samus to see Inter-dimensional Locks on Aether. It can be overloaded by immense amounts of dark energy or Phazon radiation. The Echo Visor is one of A-Kul's original tools she carried during her days and was also used by the Luminoth to help their blind population see. It sends out sonic pulses that make the HUD appear in a monochromatic color scheme. Any objects in Samus' vista sends reverberations back to her, allowing her to navigate spaces while wearing it. When Samus shoots an enemy, it sends out orange pulses, letting her know that she did, in fact, make contact with the enemy. When paired with the Annihilator Beam, it can also be used to override Echo Key Beam Systems. The Command Visor is only present in Metroid Prime 3: Corruption. It allows Samus to remotely control her Gunship remotely, giving it a much more interactive role than before. It can be used to make the ship land, shoot missiles, and pick up massive objects. It is integral in assembling the Theronian Bomb on Elysia to destroy the Leviathan's shield. The Speed Booster allows Samus to run at incredible speeds. It utilizes the booster on the back of the Varia Suit and causes Samus to cause damage to enemies that she hits while running; however, in Super Metroid, Samus will take damage by an enemy she runs into. It is also the precursor to the Shinespark. In Metroid: Other M, Samus creates a bow shock wave in front of her that kills most enemies or damages them severely. It also allows her to run up steep slopes and cover massive distance in the Bottle Ship. In Super Metroid, it allows Samus to break Speed Blocks that can only be destroyed by fast-moving objects. The Shinespark is an advanced technique Samus can perform while using the Speed Booster. When activated, Samus stops dead in her tracks, builds up her kinetic energy from running so fast, and allows her to just incredible distances. Some areas can only be explored or discovered using the Shinespark technique. In Super Metroid, it also allows Samus to destroy Speed Blocks. 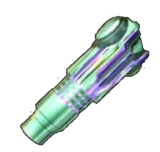 The Screw Attack is one Samus' most powerful upgrades, it combines with the Space Jump that creates a field of indestructible energy around Samus, which destroys most enemies instantly. It is especially useful for traveling long distances that can't be reached by any other method. In 2D games, it can be used indefinitely once Samus obtains the Space Jump, but in the Primes, it can only be used 5 times max to cover great distances, and if Samus hits a large enemy or a wall, she bounces off. It also allows Samus to perform the wall jump on applicable surfaces. It cannot be used underwater in Metroid Prime 2: Echoes, instead the Gravity Boost activates. The Space Jump Boots are exclusive to the Prime subseries, it allows Samus to perform a second jump while in midair and allows her to cover more distance and/or higher ledges. It also is used before using the Screw Attack. It ones of Samus' most important upgrades in the Primes and is a key upgrade used for fully exploring all planets and space stations. The Hi-Jump Boots allow Samus to jump very high and lets her reach much higher ledges and reach new areas. Sometimes, the Hi-Jump gives Samus's Morph Ball the Spring Ball ability. The Space Jump lets Samus perform an indefinite amount of midair jumps that allow her travel great distances with relatively accurate aim. It is used in conjunction with the Screw Attack and is a key item in most games. The Power Grip allows Samus to grab onto ledges. She can also lift herself from ledges. This upgrade is exclusive to Zero Mission, though it can be used in Corruption with green ledges. Samus's Fusion and Zero Suits appear to already be equipped with such ledge-grabbing functions. The Gravity Boost only appeared in Metroid Prime 2: Echoes. It replaces the Gravity Suit and lets Samus move through the liquid water on Aether unhindered, although, it does not let her go through the dark water on Dark Aether, nor does it prevent damage taken from it. After performing an underwater Space Jump, the Gravity Boost will lift Samus and propel her through the water using a booster on her back that lets her move higher and farther than traditional jumping. Interestingly, when the Light Suit is acquired from U-Mos, it disappears, but still is still fully functional. The Grapple Lasso is exclusive to Metroid Prime 3: Corruption. It is a completely new type of item that fires the Grapple Beam at an enemy like a lasso that allows Samus to rip off armor, open up doors, and even destroy armor. It is heavily used in the game and is key to defeating certain bosses, such as Omega Ridley and Aurora Unit 313. While not technically in Other M, the Grapple Beam is used as a sort of lasso against Vorash to reel it onto land to attack its weak point on its stomach. Another variant of the Grapple Beam, the Grapple Voltage appears in Corruption only and allows Samus latch her Grapple Beam onto enemies or posts and feed or remove energy from them. It is used to overload or extinguish the energy from shields and can also be used to kill enemies in a creative way. When Samus feeds energy to something, she causes damage to herself, vice versa when she takes energy from a shield, she gains energy back into her Power Suit. The Hypermode version of the Grapple Voltage. It can only be used when Samus is in Hyper Mode and lots her transfer Phazon energy to/from enemies. It is especially helpful on the Phaaze quest but overloading Phazon Crystals to destroy them and advance and feeding Phazon energy into Phaz-Ings, both methods of which lowers Samus' corruption meter, allowing her to survive longer on Phaaze's toxic surface. This page was last edited on 8 April 2014, at 18:59.